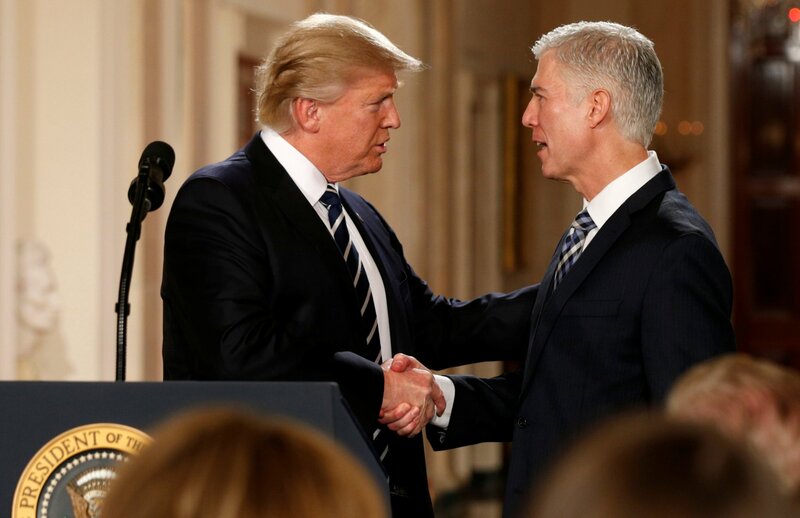 U.S. Supreme Court nominee Neil Gorsuch on Tuesday pledged independence from President Donald Trump, bristled at his criticism of the judiciary and said not even the president is above the law amid Democratic concerns he would be beholden to the man who selected him. Answering questions from senators during the second day of his Senate Judiciary Committee confirmation hearing, Gorsuch said Trump never asked him to overturn the 1973 Supreme Court ruling legalizing abortion nationwide, saying if the Republican president had done so "I would have walked out the door." Trump promised during last year's presidential campaign to appoint an anti-abortion justice who would overturn the landmark Roe v. Wade ruling, which many conservatives want reversed. If confirmed by the Senate as expected to fill a 13-month-old vacancy, Gorsuch would restore the nine-seat court's conservative majority at a time when Republicans control Congress and the White House. But the conservative federal appeals court judge from Colorado repeatedly said he was beyond politics. 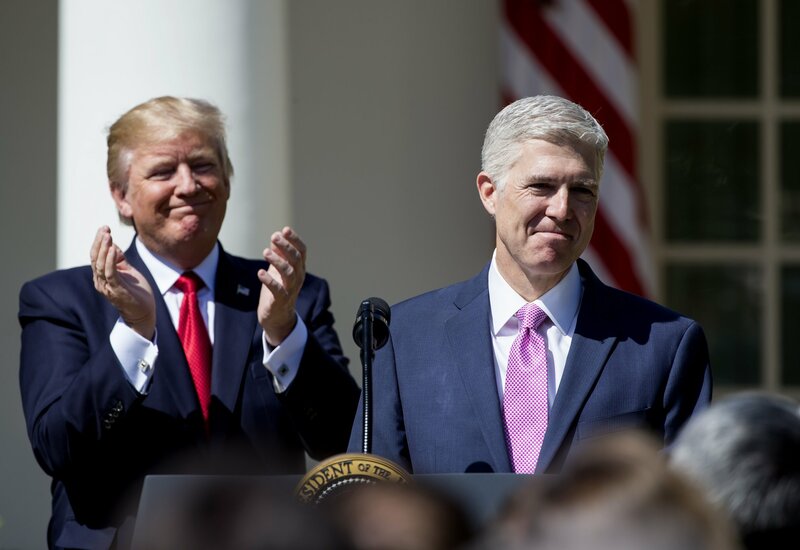 "When I became a judge, they gave me a gavel not a rubber stamp," Gorsuch said. "I am my own man," he added. Trump has assailed the judiciary both as a candidate and since taking office on Jan. 20. He condemned federal judges who have put on hold his two executive orders to ban the entry into the United States of people from several Muslim-majority countries, calling one a "so-called judge" and suggesting that blame for a future terrorist attack should go to the courts. "When anyone criticizes the honesty or integrity or the motives of a federal judge, well I find that disheartening, I find that demoralizing, because I know the truth," Gorsuch said. When Democratic Senator Richard Blumenthal asked if that includes Trump, Gorsuch said, "Anyone is anyone." Gorsuch previously made similar remarks in private to senators including Blumenthal, but Trump at the time accused Blumenthal of misrepresenting Gorsuch's comments. 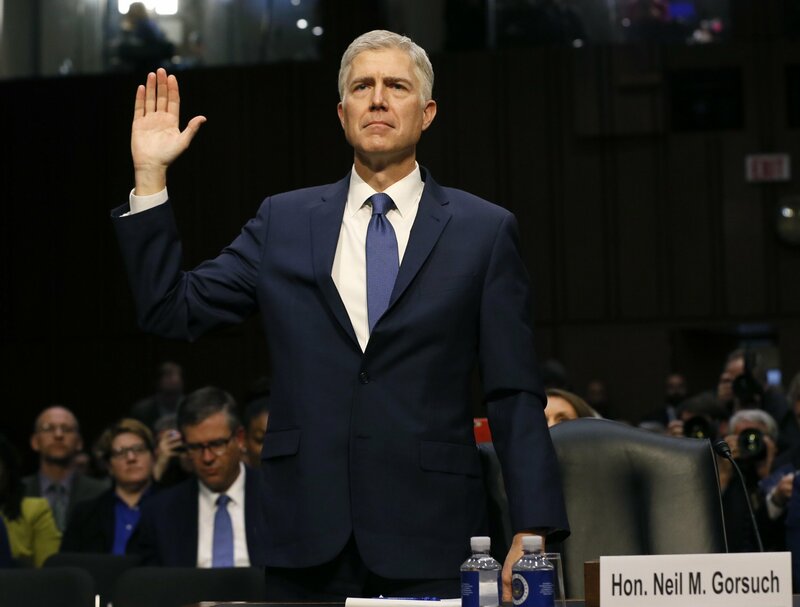 Gorsuch's steady, measured performance during the marathon session, marked by a few moments of indignation under Democratic questioning, indicated he was on track for confirmation. Democrats probed Gorsuch on whether he would be willing to hold Trump accountable. Asked by Senator Patrick Leahy whether a president has the power to violate a law on surveillance of Americans, Gorsuch said, "Nobody is above the law in this country, and that includes the president of the United States." Republican Senator Lindsey Graham said if Trump resumes the use of waterboarding, a prohibited form of simulated drowning, on detainees, he "may get impeached." Gorsuch said he would not speculate on whether Trump could be prosecuted if he authorized waterboarding, but repeated, "No man is above the law." Republicans have praised Gorsuch, 49, as highly qualified for a lifetime appointment as a justice. 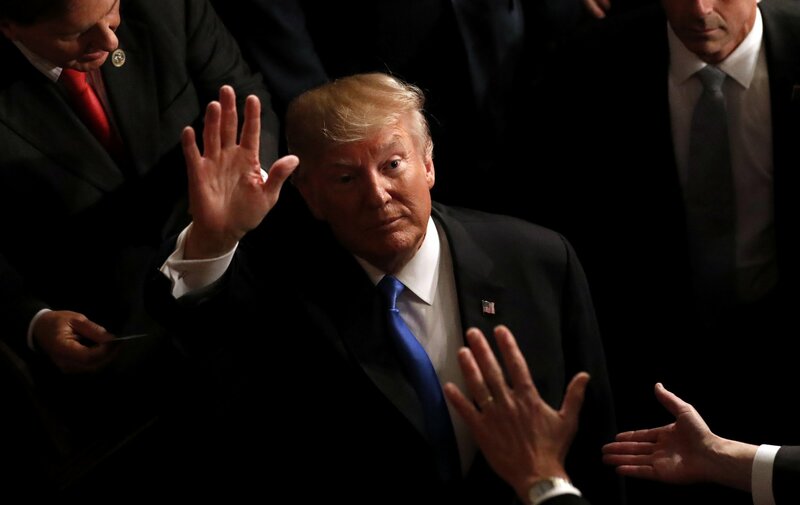 Democrats, who have slim chances of blocking his nomination, have questioned his suitability, with some portraying him as favoring corporate interests and insufficiently independent from Trump. Chuck Grassley, the panel's Republican chairman, asked Gorsuch "whether you'd have any trouble ruling against a president who appointed you." "That's a softball, Mr. Chairman," Gorsuch said. "I have no difficulty ruling against or for any party, other than based on what the law and facts in the particular case require. And I'm heartened by the support I have received from people who recognize that there's no such thing as a Republican judge or a Democratic judge. We just have judges in this country." "I have offered no promises on how I'd rule in any case to anyone. And I don't think it's appropriate for a judge to do so, no matter who's doing the asking," Gorsuch added. Gorsuch refused to offer his opinion of Trump's travel ban, saying it was an ongoing case. When Leahy brought up a Republican lawmaker's suggestion that Gorsuch would uphold Trump's ban, the nominee said "a lot of people say a lot of silly things" and that lawmaker "has no idea how I'd rule." Gorsuch said rulings should be based on the law and not politics, adding, "A good judge doesn't give a whit about politics or the political implications of his or her decision." Democratic Senator Sheldon Whitehouse pressed Gorsuch to call for the anonymous financial backers behind the Judicial Crisis Network conservative legal advocacy group's $10 million campaign supporting his nomination to identify themselves, but the nominee refused, saying he would not engage in politics. 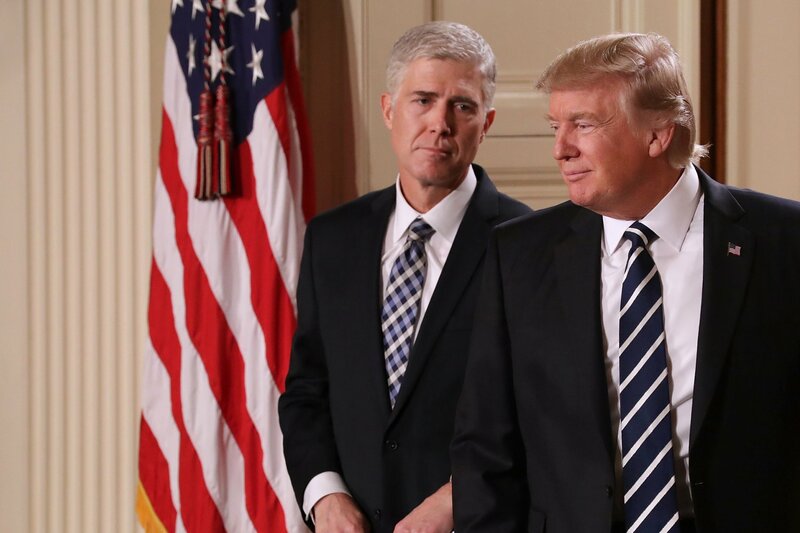 But Gorsuch added, "Nobody speaks for me." The seat Gorsuch was nominated to fill has been vacant since the February 2016 death of conservative justice Antonin Scalia. Some Democrats have said Republicans "stole" a Supreme Court seat last year when the Senate refused to consider Democratic former President Barack Obama's nominee to replace Scalia, appellate judge Merrick Garland. Questioned by Leahy, Gorsuch called Garland an "outstanding judge," but refused to answer whether Obama's nominee had been treated fairly by Senate Republicans. 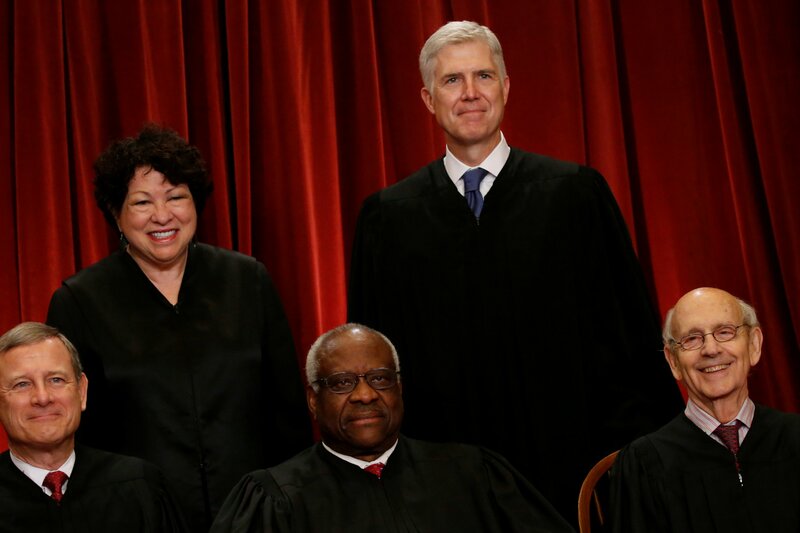 Gorsuch said Supreme Court precedents deserve respect, even as he sidestepped answering whether he thought a series of contentious cases from the past had been decided correctly, including Roe v. Wade and cases on gun rights, political spending, religious rights and the ruling tipping the 2000 presidential election to Republican George W. Bush. Gorsuch did say that the issue of gay marriage, which the Supreme Court legalized in 2015, is "absolutely settled law." Senate Democratic leader Chuck Schumer told reporters Gorsuch looked like "he's playing dodge ball," saying the nominee "has bent over backwards to avoid revealing anything." Grassley said Tuesday's session could last 10 hours and the hearing could last four days. Grassley has said the committee is likely to vote on Gorsuch's nomination on April 3. Senate Majority Leader Mitch McConnell said the full Senate would vote on confirming Gorsuch before lawmakers' mid-April recess.